The book said it was a 45 minute moderate hike through glorious old growth rain forest and they were “spot-on”. The Mystic Beach Trail is one of the most stunning sections along the Juan De Fuca Trail on the south western shore of Vancouver Island. Parts ofthe trail are visibly difficult to navigate as the “beaten-path” seems to run in all directions. It’s not until you come to old dilapidated board-walks that you know you’re headed in the right direction. About halfway along the trail you cross a elevated suspension bridge that appears to cross through the tops of tree that grow up from the Peter Wolfe Creek below. If you’re a little squeamish of heights you will do well to cross when no one else is on the bridge; having other foot traffic will tend to cause the bridge to bounce around. 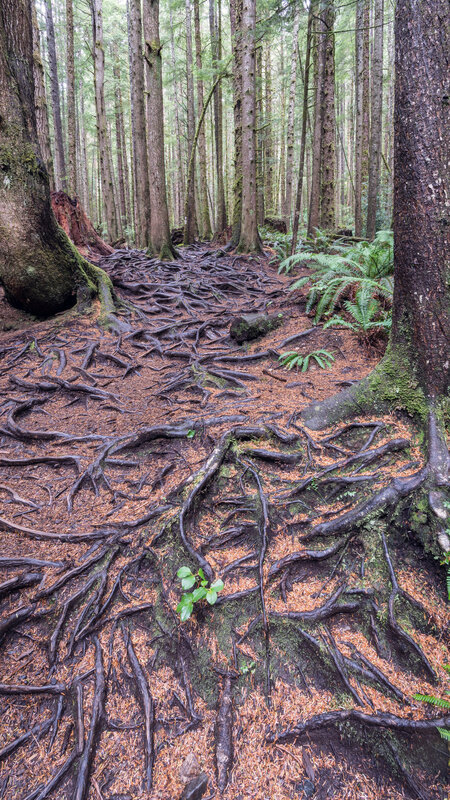 Much of the trail is covered with bare tree roots which appear to come alive under your feet. You need to watch your footing in many areas as the tree roots make for an easy tripping hazard. So look down when walking and stop before looking up & around. When you final get to Mystic Beach (hopefully at low tide) you will see a spectacular towering cliffs, smooth soft sand and a 25 foot water fall. Spend sometime exploring the beach before heading back - it is worth the journey.